Kathmandu, May 26: Prime Minister KP Sharma Oli has reaffirmed the government's commitment towards safeguarding human rights in the country. Speaking at the 17th anniversary of National Human Rights Commission (NHRC) here Thursday, PM Oli reiterated, "The government will always be dedicated to promoting and protecting human rights." 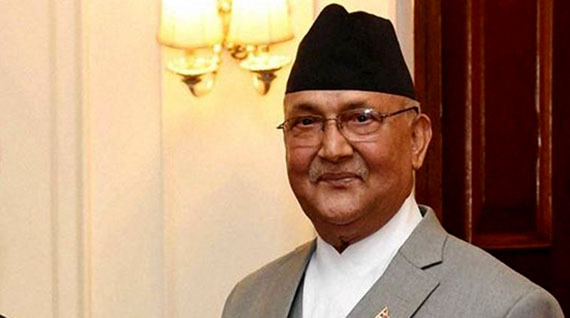 Prime Minister Oli however admitted that in lack of political consensus, cases of human rights violation were reported aplenty in the country. Furthermore, he pledged that the political differences will be sorted out so as to contribute towards this cause. Similarly, NHRC Chairman Anupraj Sharma spoke of the need for the government to forge a consensus among the political parties and to expedite the reconstruction of the quake-damaged houses to protect the human rights of the quake survivors. Urging the government to take their recommendations seriously, he said that the freedom, equality and right to live with dignity among others basic human yearning be acknowledged as the inherent rights. On the occasion, a report themed ' Collection of Important Recommendations furnished by the NHRC-2073' and a magazine 'Sambahak' chronicling the Commission's activities were unveiled. Moreover, the Commission honoured six of its staffers for their service in the NHRC exceeding 15 years. Also on the occasion, NHRC feted journalist Shyam Sundar Sashi of Janakpur with 'Dayaram Pariyar Human Rights Memorial Honour-2072'. Social activist Charimaya Tamang was also honoured in recognition of her contribution for rescuing trafficked women and rehabilitating them.